October 15, 2016 – NASA is seeking plant varieties that could grow best in space, providing food for astronauts to eat on their way to future deep space destinations, including Mars. Teachers and students in South Florida recently began experiments to test a wide spectrum of seeds to see which would flourish in different conditions. The project began its second year in early September when teachers from 115 schools in and around Miami met at Fairchild Tropical Botanic Garden in Coral Gables, Florida, to receive growing stations similar to the ones astronauts and scientists use for space research. The containers use LED lights in shades of red, blue, and this year white, along with a fertilizer mix that approximates what seeds would find in orbit. The students and teachers are planting different varieties to see how they grow. The plants grown were chosen in part by how little is known about them. In other words, the students will perform research that will help show NASA scientists which plants are good candidates to try to grow in space. The more participation, the more seed varieties researchers can either mark down for space travel consideration or cross off the list. It’s an enormous help for plant scientists, Smith said. Two years into the partnership, the schools have tested dozens of edible, leafy plants. The classrooms upload data to Fairchild Tropical Botanic Garden where the Fairchild and NASA team review results. They also are required to post weekly social media photos tracking the progress of their plants. This year the tweets can be found on Twitter at, “@GrowBeyondEarth”, or they can be viewed at https://twitter.com/GrowBeyondEarth?lang=en. Gioia Massa, NASA payload scientist for Veggie and the rest of the science team have been working to answer questions about growing plants in space for several years during their research at NASA’s Kennedy Space Center in Florida. The work paid off dramatically during several recent missions as astronauts grew red romaine lettuce plants and zinnia flowers in orbit aboard the International Space Station. Veggie is sponsored by NASA’s Space Life and Physical Sciences Research and Applications. The astronauts even sampled the fresh flavors of some of the lettuce. NASA hopes astronauts on deep-space exploration missions such as those to Mars can take along seed packs to grow a portion of their food during the voyages. The goal is not to provide a major food source, but rather to enhance astronaut diets with fresh vegetables and provide a sense of their home planet. There also are positive psychological benefits to astronauts growing plants in orbit, especially on the way to Mars when the size of the Earth shrinks by the week. The plant studies also look at different harvesting techniques for plants, including cut-and-come-again, when some of the leaves are removed, but others left on. Harvesting a little at a time and keeping the plant intact is expected to enable astronauts to enjoy more fresh food in space in comparison to simply harvesting the whole plant when mature. The partnership developed soon after the Fairchild Tropical Botanic Garden learned about the Veggie project and the Veggie team learned about a Fairchild project. NASA awarded Fairchild a grant to help with its education effort. One of Fairchild’s hallmark STEM outreach activities is its Million Orchid Project, which enables students to develop new methods to grow and transplant South Florida native orchids in hopes of restoring the orchid population. Smith and Massa realized the STEM Million Orchid Project and its power to engage and enable students to perform real science experiments could be used to assess space crop candidates, because orchids are tough to grow and make flourish. There was a real engine to bring science experiments to the students and the students to test and provide real data for crop assessment. “There was a real mutual respect and excitement for what each other was doing,” Smith said. Smith and Massa acted as the judges for the first year of the project, grading each of the 115 schools’ results. Although the most obvious difference between space and Earth farming is the presence of gravity, Smith said the Veggie experiments have shown that plants depend on many other factors to grow well. Plants that are robust on Earth and grow in a wide variety of conditions likely will have a good chance of growing in orbit. “If you get a plant that can grow well in all the classrooms – some are hot, some are really cold, kids are sneezing on them, the humidity is always changing – that’s a plant worth looking at for growing in space,” Smith said. 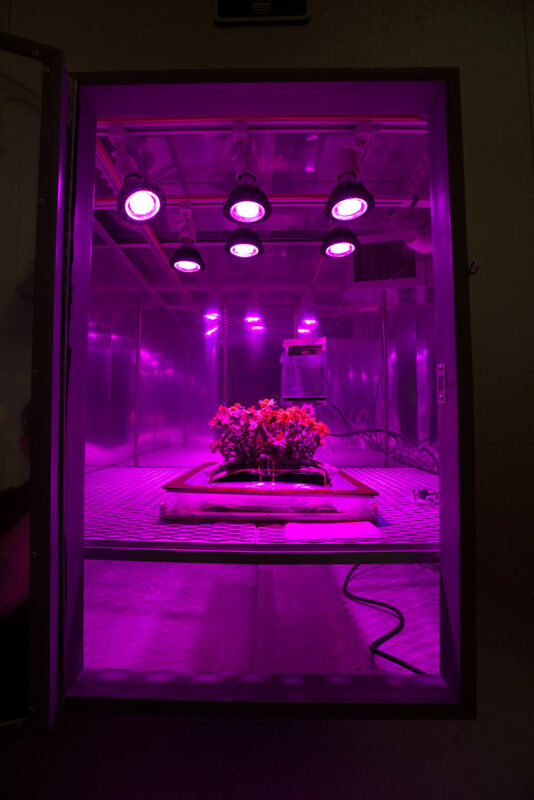 The International Space Station’s Vegetable Production System (“Veggie”) experiment is a deployable plant growth unit used to grow salad-type crops to provide the crew with appetizing, nutritious and fresh food and support crew relaxation and recreation. Sierra Nevada Corporation’s subsidiary, Orbital Technologies Corporation (ORBITEC), is responsible for the Veggie plant growth facility, which was installed on the ISS in May 2014.